The catastrophe facing Mother Nature because of environmental pollution was outlined by United States President Barack Obama from Anchorage in Alaska where incredible changes are taking place, affecting not only the Arctic region but the whole world. “We are here today to discuss a challenge that will define the contours of this century more dramatically than any other – and that’s the urgent and growing threat of a changing climate”, he told Foreign Ministers from the Arctic region at a glacier conference. According to Mr. Obama, human activity is disrupting the climate in many ways faster than we previously thought. The science is stark. It proves that this once distant threat is now much in the present. The Arctic is the leading edge of climate changes -- the leading indicator of what Planet Earth faces. Arctic temperatures are rising about twice as fast as the global average. Last year was Alaska’s warmest year on record -- just as it was for the rest of the world. “Climate change is no longer some far-off problem. It is happening now. Climate change is already disrupting the world’s agriculture and ecosystems, our water and food supplies, our energy, our infrastructure, human health and human safety today. Climate change is a trend that affects all trends -- economic trends, security trends. Everything will be impacted. And it becomes more dramatic with each passing year,” Mr. Obama said. One new study estimates that Alaska’s glaciers alone lose about 75 gigatons - that’s 75 billion tons - of ice each year. The pace of melting is only getting faster. While hoping that the US will honour its commitments at the World Climate Summit later this year, the new National Government and the people of Sri Lanka need to address the issues facing this island nation. Being surrounded by the sea, the major issues facing Sri Lanka include climate change, rising sea levels and temperatures and the threat posed to our biodiversity which has been our country’s pride and economic wealth. We hope that President Maithripala Sirisena, who is personally in charge of environmental affairs, will act fast, effectively and courageously to save Mother Nature and Mother Earth. 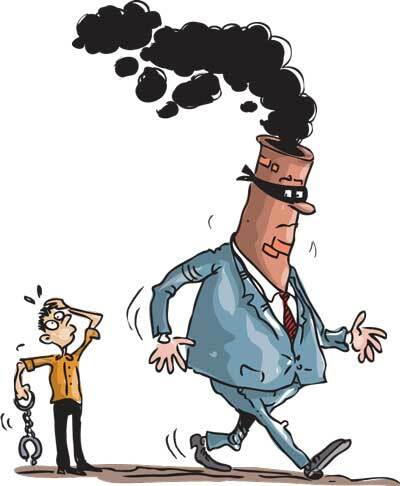 World environment experts including lawyers have proposed legislation to deal with eco - crimes. It would mean that any multi-national corporation or other companies found guilty of large-scale pollution could be held accountable for criminal offences or crimes against humanity. That could mean their chairmen or CEOs could be jailed for several years and the companies would have to pay multi-million-rupee fines. During the past few weeks there has been a major controversy over a multi-national beverage company polluting the Kelani River. It was first reported to be an a oil leak. But the Environmental Protection Authority said this week that tests in a specialized Indian laboratory had shown that the polluting substance was a metallic chemical. Readers can judge what this means, the message in the bottle. In this era of good governance and social justice, if the TNCs or the authorities are not seeing this as an eco-crime, then there needs to be consumer action and resistance. These and other eco-crimes need to be taken to the Court of the People.